LAFAYETTE, Colo. – Fifteens National Champion Davenport leads a strong inaugural Women’s Division II bracket at the 2016 USA Rugby College 7s National Championships, where 60 teams in total will compete for one of three titles at WakeMed Soccer Park in Cary, N.C., May 27-29. The live broadcast of all 167 games will be free to view on The Rugby Channel. While Davenport will be a favorite to win the nine-team DII competition based on its spring successes, the likes of Bloomsburg and Montana State will raise the standard of play across the Memorial Day-weekend tournament. College 7s begins Friday, May 27, but DII play will not get underway until Saturday. All nine teams will finish pool play before the four lowest-ranked teams end the day with two knockout matches to determine Plate Semifinal seeding. The top four teams at the end of pool play will automatically qualify for the Cup Semifinals, and the fifth-best team will receive a bye into the Plate Semifinals. The Panthers out of Michigan have been busy since the program began in 2013. Greg Teliczan’s team had a light season that year in comparison to the kind of schedule they put together for the 2015-16 season, and finished runner-up in the 2013 College 7s Shield Final. Sevens has been a priority for Davenport, even in a year in which a 15s campaign brings two championships to Grand Rapids. The Panthers won the Division II Fall Championship in December in the 12th match of the semester (having gone 12-0 with one match against a senior club) and somehow worked two sevens tournaments into a 10-match National Championship run in the spring. Springfield and Utah State will have their work cut out for them in Cary. Neither team has previously had the opportunity to reach the National Championship stage in sevens and they are pooled with a team that consistently competes with Division I opposition. The Pride are no slouches, however, and earned their place in the new DII bracket with wins at their home tournament, Pride Sevens – where Springfield qualified for College 7s – and at a Williams College-hosted tournament a month ago. Bloomsburg may not only fancy its chances in Pool B, but in the Cup round, as well. The Huskies were 2015 15s Fall Championship Semifinalists easily, beating Rutgers and pool mate Ithaca in the playoffs by a combined score of 154-22. Led by first-year center Nicole Snyder, Bloomsburg held a 21-point lead after 40 minutes in the Semifinal against Davenport. The Panthers ended up showing their class by shutting out the Huskies in the second half to come away with the win. Snyder and her team forcefully moved into the spring sevens season, and finished second in the ACRA Sevens tournament before testing the waters in Penn State’s DI tournament May 14, where it finished third overall. Hungry to avenge its only 15s loss of the fall campaign, Ithaca will line up against the Huskies first Saturday. Qualified via Upstate New York Collegiate Rugby Conference 7s, the Renegades have transferred 15s wingers Kaitlyn Conmy – who can kick as well as beat teams with pace – and Amy Johnstone to the short-form version of the game with success. The Scarlet Knights’ 15s season somewhat replicated their two-day performance in the Women’s Division I bracket at College 7s last May – apart from a Day One-opening loss to eventual National Champion Penn State. UC Davis and Montana State were dealt a difficult hand with Rutgers hitting on most cylinders in Denver on that day, but Ken Pape’s team could not keep the roll going into the Cup round, losing to Virginia in a Quarterfinal shutout. Stanford won the Plate at the expense of Rutgers, which gave Pape’s squad a thirst for more championship rugby. The one-loss team in the 2015 Tri-State Conference season was confident enough to rest its starting XV in the Championship match against Vassar, which it won 118-0, but could not handle Snyder and Blooomsburg in the Fall Championships for an end to the season. Montana State may not have won a match at College 7s last year, but they gained experience from a couple of competitive DI matches that coach Ed McKenna hopes will put his team in good stead come Memorial Day weekend. No player on the Bobcats’ roster has more than four years experience, but that did not stop the team from a valiant run into the Quarterfinals of the Fall Championship, knocked out by eventual runner-up Winona State. 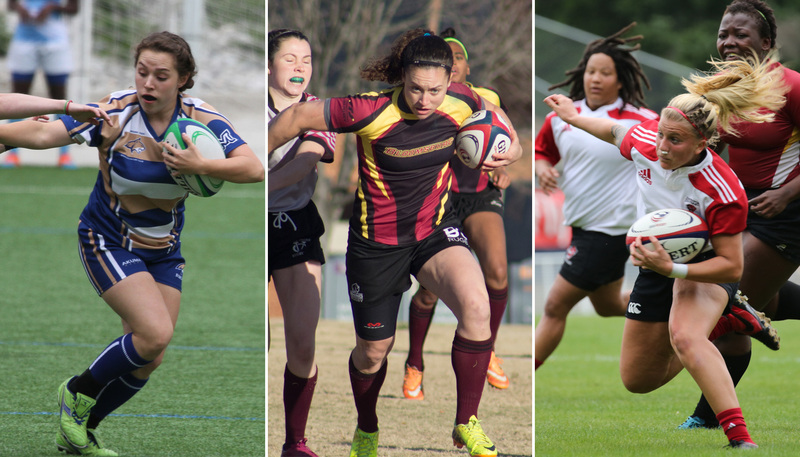 Pool play for the Women’s Division II College 7s National Championships begins Saturday, May 28, at 9 a.m. ET, with the seeding playoff matches pitting No. 6 versus No. 9 and No. 7 versus No. 8 scheduled for that evening. The Cup Final will kick off from WakeMed Soccer Park’s stadium at 1 p.m. ET Sunday. A full schedule for the 2016 USA Rugby College 7s National Championships can be viewed here. Each of the 167 games at College 7s will be broadcast and aired free of charge on The Rugby Channel.